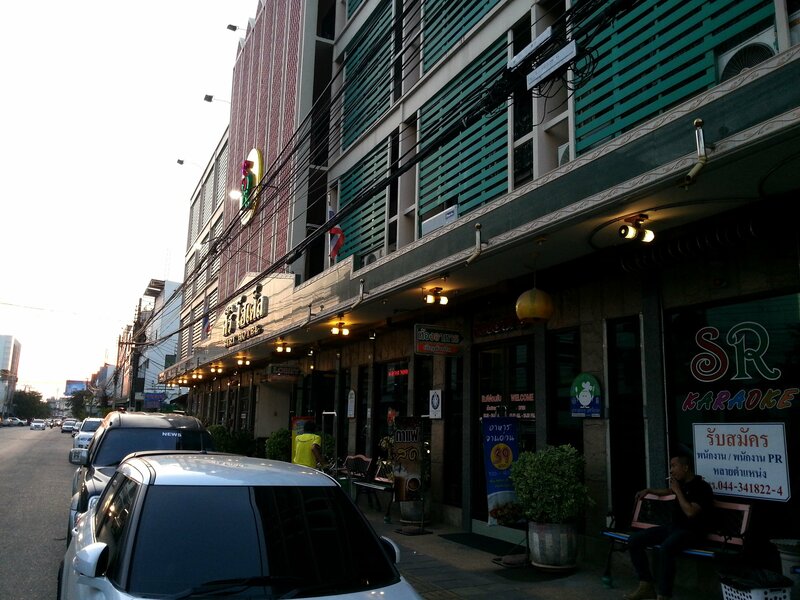 The Siri Hotel is the most popular hotel in Nakhon Ratchasima for foreign visitors. The Siri Hotel is the only hotel in Nakhon Ratchasima which is focused on catering for foreign visitors hence its popularity. There are better quality local hotels, such as the Romyen Garden Place, which are geared up for domestic tourists but it is worth noting that they cost about twice as much per night compared to the Siri Hotel and don’t have English language TV channels, or Western food in the restaurant, or great English language skills. The Siri Hotel has a lot going for it. Firstly, it has a great location. The hotel is walking distance from Nakhon Ratchasima Railway Station (950 metres) and a further 1.2 km along the same road and you come to Suan Rak Park which features various sculptures including the famous Ya Mo Statue. The second really good thing about the Siri Hotel is that it’s great value for money. 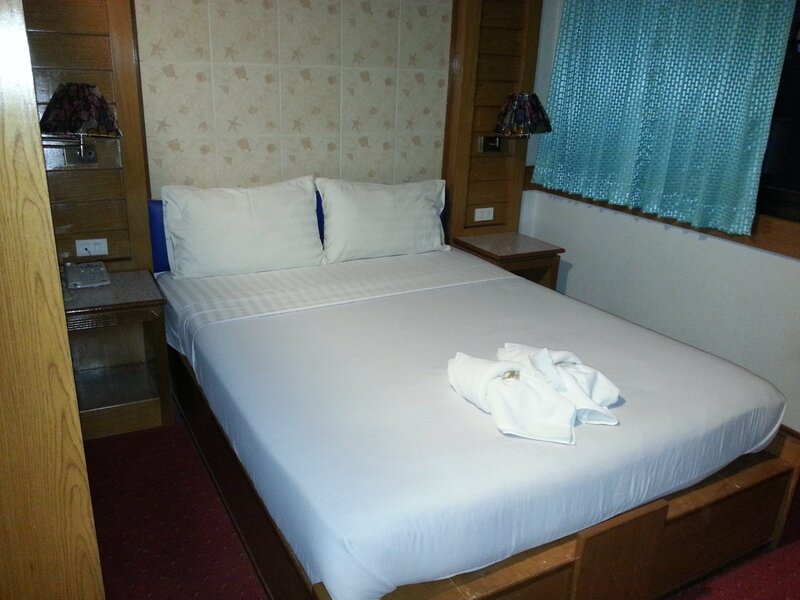 If you walk in and book a room, or book a room online, its 550 THB for a pretty good 3 Star standard room – it costs 700 THB per night if you select the buffet breakfast as an optional add-on. Food and drinks are also (mostly) really good value for money. See below for what I mean by ‘mostly’. The third thing the Siri Hotel has gotten right is the quality of the service – it’s efficient, friendly and helpful. The check-in process is really quick and the reception staff smile. The only slightly negative thing about the service is that seem to be very insistent that you pay for things straight away rather than settle up later. Not a problem, but perhaps a reflection of problems they may have encountered with guests in the past. The most basic rooms are pretty good, and although not very large they come equipped with everything you might need for the night except a water heater (kettle) and an in-room safe. 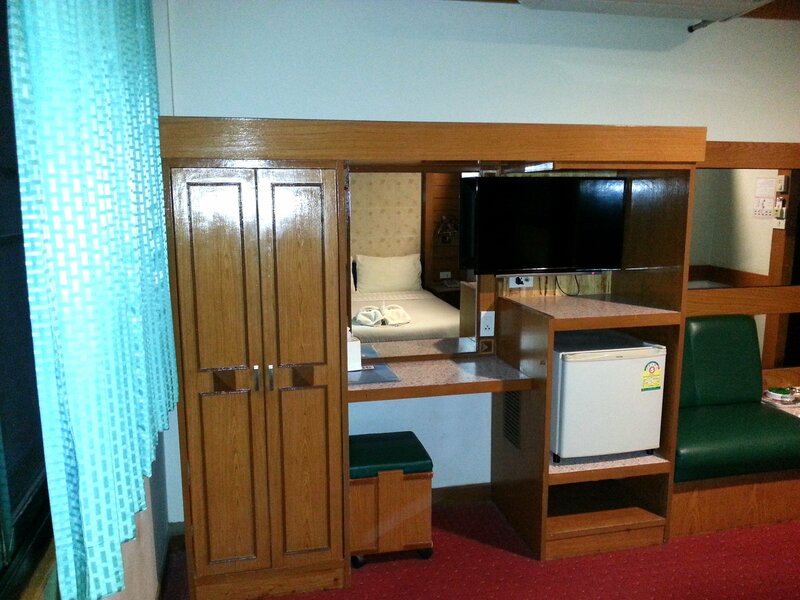 The air-conditioning worked fine, and was adjustable, the fridge was effective and the bed was comfortable. The WiFi connection was quick although you need to keep on logging in for each new session, so keep the small printout of the password which you are issued at check-in to hand because you will need repeatedly. The range of TV channels was adequate but not great. There are two English language film channels, neither of which you would describe as premium. There was no BBC news but there was Fox news and a couple of other English and French language news channels as well as sports channels. This said, compared to other Nakhon Ratchasima hotels where I have stayed which have no English language channels whatsoever, the Siri Hotel is a clear winner when it comes to in-room entertainment. The bathroom was fine. Importantly, the shower had properly hotel water and was clean and well maintained, as was the bedroom itself. The hotel provided free soap, 2 free bottles of cold water in the fridge and nothing else, which for the room price of 550 THB per night is pretty normal for Thailand. 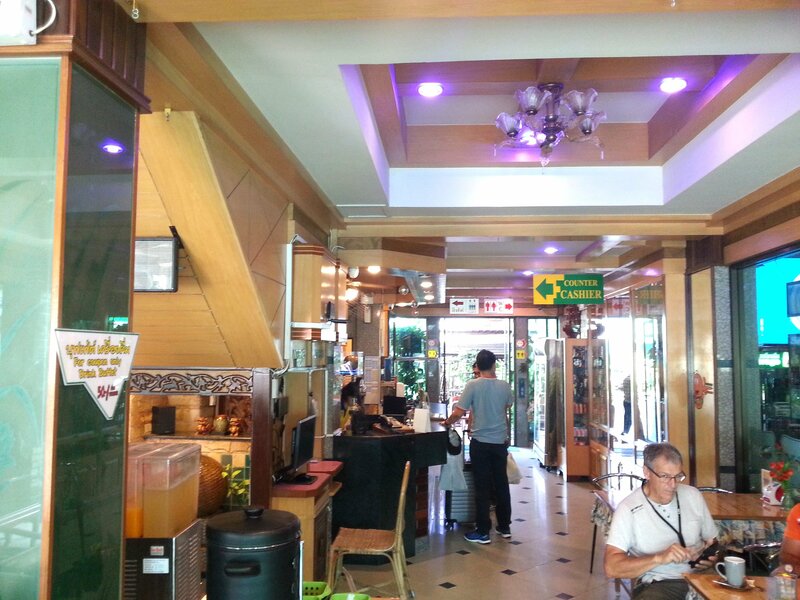 The Siri Hotel has a popular restaurant located in the ground floor lobby. 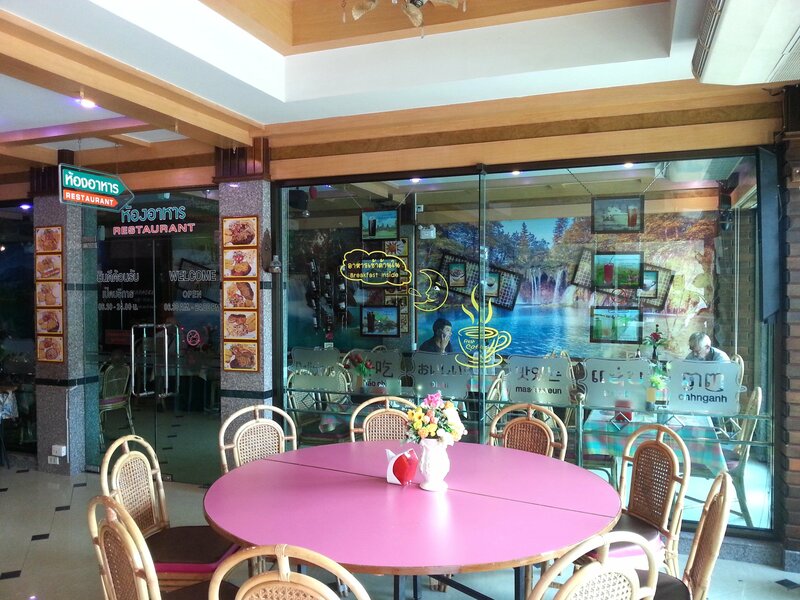 As well as the buffet breakfast, they also serve a range of Asian and Western food. Drinks and Asian food are very reasonably priced, although they charge disproportionately high price for Western food: 250 THB for ham and chips and 350 THB for steak and chips. Considering the room price, the price of the Western food is way over the top. If you walk about 200 metres along the same road as the hotel towards the park and the Old Town you will come to an area with outdoor stalls and tables on both sides of the road. The food outlet on the same side of the road as the hotel sells a decent chicken or pork steak and chips for 59 THB and you can buy very cheap drinks from a nearby shop to accompany your meal. Much better value is the tea and coffee station set up in the lobby where self-service tea, coffee and juice is available at 20 THB a cup. There is also a fridge by the reception where beer and soft drinks are sold 24 hours a day at only a slightly higher price than the shops nearby, all of which seem to close around 8 pm in the evening. Beyond the reception, and past the elevator, is a small outdoor seating area which is popular with guests in the early evening as place to drink beer and in the morning as a place to smoke and drink coffee. Except for the overpriced Western food, the Siri Hotel has great catering facilities for a foreign visitor looking for value for money. In terms of the price, and the category of hotel, I give the Siri Hotel 9 out of 10. I will stay here again the next time I go to Nakhon Ratchasima.